Over the past decade, the ACM International Conference on Distributed and Event‐based Systems (DEBS) has become the premier venue for contributions in the fields of distributed and event‐based systems. The objectives of the ACM International Conference on Distributed and Event‐Based Systems (DEBS) are to provide a forum dedicated to the dissemination of original research, the discussion of practical insights, and the reporting of experiences relevant to distributed systems and event‐based computing. The conference aims at providing a forum for academia and industry to exchange ideas through industry papers and demo papers. 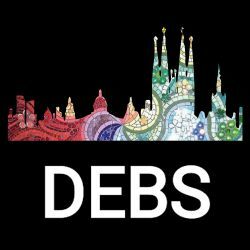 DEBS 2017 will take place at the premises of the Universitat Politècnica de Catalunya (UPC), located in the south of Barcelona, close to the airport and to the city centre. The DEBS conference covers topics in distributed and event-based computing. The scope of the conference includes systems dealing with detecting, processing and responding to events and with massively distributed middleware and applications. Examples of application domains covered by the conference include the Internet of Things, sensor networks, social networking, finance, healthcare and logistics. Technologies discussed include real-time analytics, complex-event detection, security, reliability and resilience, energy management and green computing, stream processing, embedded systems, and cloud, peer-to-peer, ubiquitous and mobile computing. Topics relevant to enterprise-level computing include enterprise application integration, real-time enterprises, Web services and support for enterprises to respond in timely fashion to changing situations. The Research Track presents original research contributions. Submissions will be evaluated by an experienced program commitee consisting of eminent researchers from all over the world. The Industry and Experience Reports Track is meant to report on innovative deployments of event‐based systems. Contributions will be reviewed by researchers and industry practitioners working in distributed and event‐based computing. In the Poster and Demo Track authors report on work in progress and/or arrange to demonstrate interesting ideas and applications pertaining to distributed and event‐based systems. The Doctoral Symposium Track is meant for doctoral candidates whose research area overlaps with distributed and event‐based systems. The Grand Challenge Track: Here the commitee will set out a grand challenge problem and then judge the most innovative approaches to its solution.